We all know that music can make or break your run. It can motivate you to complete that last mile, help you achieve your personal best and or just distract you from the discomfort you are experiencing. Plantronics knows this and has helped develop headphones that help you run to your own beat. Whether you're a hip-hop head or a classical fan, a custom soundtrack is your own secret weapon when it comes to running. One 2015 study in the Journal of Strength and Conditioning Research found that “music was able to activate the pre-frontal cortex area, minimize perceptions, improve performance, and accelerate recovery during 5 km of running. However good your playlist though, it’s only as good as the headphones you play them through. Tinny sounding and poorly fitted headphones can cramp your style and performance as badly as inappropriate shoes. Two options we like are the new Plantronics BackBeat FIT and Plantronics BackBeat FIT 505. Sweatproof and with a battery life of up to eight hours, these are a perfect companion to your training, whether you’re braving the elements digging in for that ultramarathon or doing HIIT at the gym. 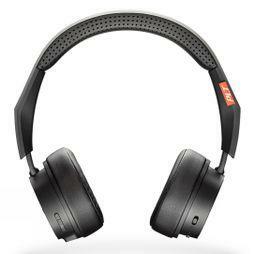 They’re comfortable, completely wireless, both lightweight and durable owing to their nano-coat. The added functionality of easy to access on-ear controls means no more interruptions to dig out your phone when that playlist goes awry. Still need convincing? This is what our team has to say about the headphones. "The lightweight fit of the headset you would be forgiven for barely noticing that you were wearing headphones. Unlike many standard in-ear headphones, the BackBeat FIT earbud sits comfortably in the ear and reassuringly remains there throughout the duration of the run"
"With just 2 hours required to fully charge the headset, this conveniently fits into the day perfectly and offers an output of up to 8 hours of music, although answering calls will reduce the battery life by a couple of hours. A nice touch is that the headphones announce your battery status after each hour of use. Once the battery is charged, the headphones are connected to your phone effortlessly through a Bluetooth connection." 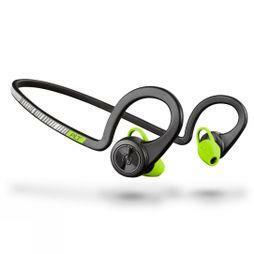 "Acoustically the BackBeat Fit performs incredibly well for such a small device and do not completely block out your surrounding which is important when running on the roads. Despite the buttons being near one another, answering calls, skipping songs and adjusting volume levels are easy to use. Nonetheless it is important to read the manual for ease of use. " "Using the BackBeat FIT 505 headphones at the gym was great. They look really nice, and were a massive upgrade from my previous ‘bog-standard’ wired in headphones they made me feel pretty ‘on-trend’. On a more practical note, with them being wireless, straight away I noticed that I felt much freer to move, without having to worry about catching the wire and uncomfortably yanking them from my ear. They allowed me to place my phone well out of the way, which also came in super handy when I went on to my strength training, that as a runner I never look forward to. "It was also really easy to connect them to my iPhone. All I had to do was turn them on, turn Bluetooth on and follow the instructions. They now automatically pair every time, which is really convenient. The controls are also really easy to use "
"The BackBeat FIT allows you to do pretty much anything you want with the press of a few easy to reach buttons, even mid-stride! Once I had familiarised myself with the control combinations, which were easy to remember, I could adjust volume, play, skip and pause music and hear my remaining battery life." So, headphones sorted: what about the tunes? Here’s what’s firing us through our next 10k.